Demonstration of saturation of PCr labeling at higher CK fluxes. To characterize intracellular energy transfer in the heart, two organ-level methods have frequently been employed: ³¹P − NMR inversion and saturation transfer, and dynamic ¹⁸O labeling. 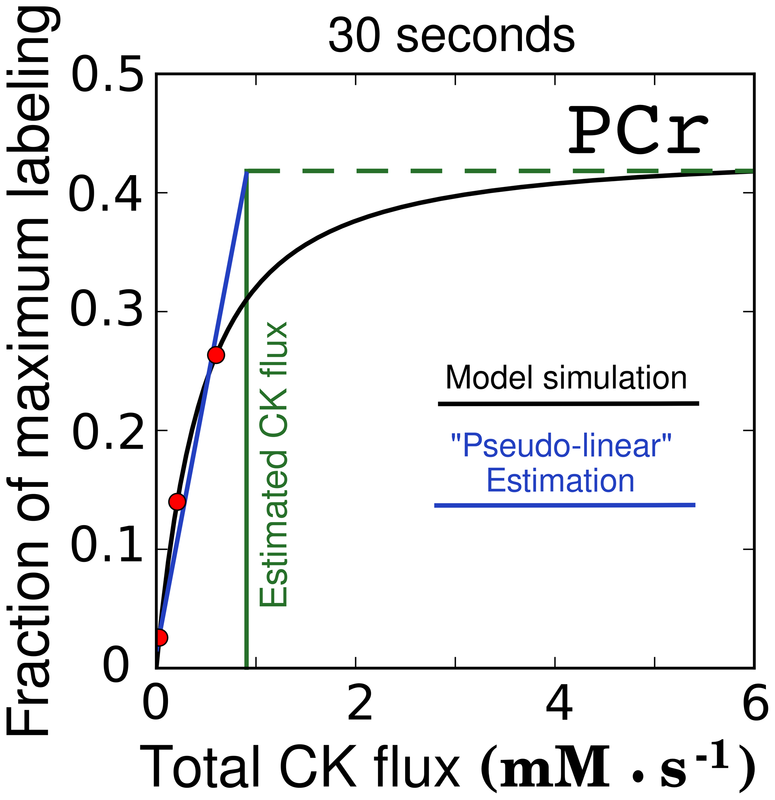 Creatine kinase (CK) fluxes obtained by following oxygen labeling have been considerably smaller than the fluxes determined by ³¹P − NMR saturation transfer. It has been proposed that dynamic ¹⁸O labeling determines net flux through CK shuttle, whereas ³¹P − NMR saturation transfer measures total unidirectional flux. However, to our knowledge, no sensitivity analysis of flux determination by oxygen labeling has been performed, limiting our ability to compare flux distributions predicted by different methods. Here we analyze oxygen labeling in a physiological heart phosphotransfer network with active CK and adenylate kinase (AdK) shuttles and establish which fluxes determine the labeling state. A mathematical model consisting of a system of ordinary differential equations was composed describing ¹⁸O enrichment in each phosphoryl group and inorganic phosphate. By varying flux distributions in the model and calculating the labeling, we analyzed labeling sensitivity to different fluxes in the heart. We observed that the labeling state is predominantly sensitive to total unidirectional CK and AdK fluxes and not to net fluxes. We conclude that measuring dynamic incorporation of ¹⁸O into the high-energy phosphotransfer network in heart does not permit unambiguous determination of energetic fluxes with a higher magnitude than the ATP synthase rate when the bidirectionality of fluxes is taken into account. Our analysis suggests that the flux distributions obtained using dynamic ¹⁸O labeling, after removing the net flux assumption, are comparable with those from ³¹P − NMR inversion and saturation transfer.